Arran is a magical island, often described as “Scotland in Miniature”, with its incredible diversity of landscapes and seascapes. 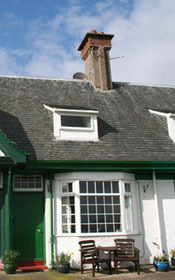 This self catering cottage has magnificent views of the sea and Holy Isle which is nestled in the bay. Recently refurbished to a very high standard it can accommodate up to 4 people in style and comfort. Free unlimited internet access. An ideal base to enjoy your Holidays on Arran. "The Retreat" formerly Number 23 Hamilton Terrace is located in Lamlash, only a five minute drive from the ferry terminal in Brodick. This peaceful village is the second largest in Arran and is located in the south of the island in Lamlash Bay. The Isle of Arran contains lots of wildlife from red squirrels to red deer. Part of Lamlash Bay is home to Scotland's first no take Zone, this protects the sea bed and marine life which has led to an increase in the amount of sea and bird life in the area. On most days you can see seals out basking on the rocks and occasionally dolphins can be spotted in the bay. "The Retreat" is the perfect bolt hole for anyone wanting to get away from it all. Self Catering Holiday Cottage on the Isle of Arran, Scotland.